Q: The United States Trade Representative Robert E. Lighthizer yesterday characterized China and its industrial policies as unprecedented threat to the world trading system. I am wondering if you have any comment on that? A: Both China and the US are members of the World Trade Organization (WTO). The WTO has an objective assessment system to judge whether the policies of China and the US, as the two largest economies in the world, are appropriate or not. As to your question, I would like to stress again that, since its accession to the WTO, China has strictly observed the WTO rules and faithfully implemented its obligations and made important contributions to the effective functioning and development of the multilateral trading system. In fact, various countries, the US included, have also gained enormous interests from their trade with China. In the meantime, China stays committed to following the path of reform and opening-up to give the market a decisive play in resource allocation. As I said yesterday, China will steadfastly support open world economy and continue to improve the environment for business to operate in, and it is the protector, builder and contributor of multilateral trading system. As a matter of fact, the WTO members have overwhelmingly affirmed China's commitment to multilateral trading system and are looking forward to a major role played by China in multilateral trading system. As to the economic and trade relations between China and the US, we have said multiple times that they are mutually beneficial in essence. Plenty of facts have proven that upholding the sound and steady development of the economic and trade relations between China and the US serves the fundamental interests of the two countries and peoples. As WTO members, both China and the US should uphold the authority of WTO rules and jointly improve the rule-based, fair and open multilateral trading system with the WTO at the core. Q: There is information that the Meeting of Foreign Ministers of the Six Countries and Iran on the Iranian Nuclear Issue will be held at the UN Headquarters in New York on September 20. Will the Chinese side attend this meeting? Do you have any expectation for this meeting? A: Upon agreement, the six countries of the Iranian nuclear issue and Iran will hold the meeting of foreign ministers at the UN Headquarters in New York on September 20 local time. This meeting will review the progress of the implementation of the Joint Comprehensive Plan of Action (JCPOA) and provide political guidance for the following implementation. 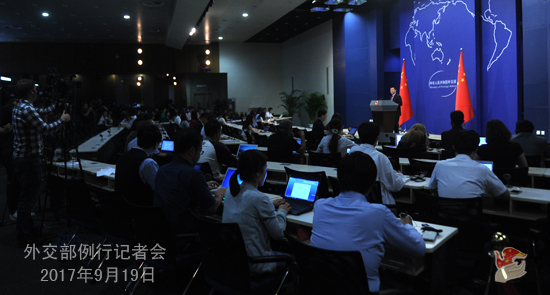 Chinese Foreign Minister Wang Yi will be present at the meeting. The JCPOA is an important outcome of international security governance and a model of resolving international hot-spot issue through political and diplomatic means, which has played a key role in upholding international non-proliferation regime and the peace and stability of the Middle East. 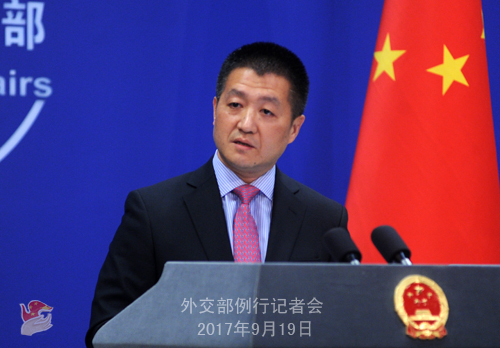 From the very beginning, China has firmly supported the JCPOA and been actively involved in its implementation process. We hope that various parties can build political consensus, properly manage differences and promote steady and long term implementation of the JCPOA through this foreign ministers' meeting. Q: Myanmar State Counselor Aung San Suu Kyi delivered a televised speech today about the situation in the Rakhine State. I am wondering if China has any comment on that? I also have two questions about the DPRK: First, the DPRK state media said that any new UN sanction will only speed up its nuclear weapons program. How do you respond to that? Second, US Defense Secretary Jame Mattis said that the US has many military options against the DPRK, including some that won't put the ROK at risk. What's your comment on that? A: We have noted the address just delivered by Myanmar State Counselor Aung San Suu Kyi at noon, which we hope will help the international community to better know about the situation in Myanmar and understand and support the Myanmar government' s effort to achieve domestic peace and national reconciliation. As a friendly neighbor of Myanmar, the Chinese side will continue providing necessary assistance for it to uphold internal stability and development. As to the first question you raised about the situation on the Korean Peninsula, I shall point out that the resolutions adopted by the UN Security Council have embodied the shared will of the international community. We believe that the comprehensive and accurate implementation of these resolutions can bring peace and stability to the Korean Peninsula and the rest of the region. As to the military threats sent out by the relevant parties on the Korean Peninsula, I stated China's stance yesterday from this podium. The fact how the Korean Peninsula issue has evolved to where it is today has proven that the military threats, either in terms of rhetoric or action, have failed to help resolve the issue. On the contrary, they have in most cases heightened the tension on the Korean Peninsula and made it even more difficult or complex to settle the Korean Peninsula nuclear issue and achieve the denuclearization of the Korean Peninsula. We hope all the relevant parties can return to the spirit and principle of all the DPRK-related Security Council resolutions, including the just adopted Resolution 2375 and implement the UN Security Council resolutions in a comprehensive and accurate manner. Q: US President Donald Trump will address the UN General Assembly today US time, in which he will mention the Korean Peninsula nuclear issue. According to a US official, he is not going to talk too much about "China's responsibility". What's your view on this? Will China and the US communicate on the Korean Peninsula nuclear issue on the sidelines of the UN General Assembly? A: It's not appropriate for me to make remarks ahead of President Donald Trump's speech. As to those opinions that President Donald Trump may put forward on the Korean Peninsula issue according to the US official you mentioned, I can only say that we maintains that the core of Korean Peninsula nuclear issue is security issue and the crux is the contradiction between the US and the DPRK. So we have been stressing that with regard to the Korean Peninsula nuclear issue, all the relevant parties should undertake their due responsibility and play their due role in promoting the peaceful settlement of the issue. We hope the US side can also act this way. To answer your second question, Foreign Minister Wang Yi has arrived in New York. He will attend the meetings of the UN General Assembly and make remarks in the general debate. Also, he will conduct a series of bilateral activities. We will release the relevant information once we have it at hand. Q: Yesterday, President Xi Jinping and President Donald Trump had a telephone conversation. What is President Xi's view on Korean Peninsula nuclear issue? A: We have issued a readout of the telephone conversation between President Xi Jinping and President Donald Trump, which mentioned that the two heads of state exchanged views on the current situation on the Korean Peninsula. I can tell you that President Xi Jinping stated China's consistent principled position on the Korean Peninsula nuclear issue. Q: It marks the 12 anniversary of the signing of the September 19 Joint Statement today. Taking a look at the current situation on the Korean Peninsula, does China still believe this Statement makes sense? Do you still remain optimistic about the Six-Party Talks? A: The September 19 Joint Statement is the most important outcome of the effort to resolve the Korean Peninsula issue through dialogue and negotiation and marks a milestone. It marks the 12th anniversary of the signing of the September 19 Joint Statement today, and we may revisit the main contents of the Statement, for example, "The DPRK committed to abandoning all nuclear weapons and existing nuclear programs and returning, at an early date, to the Treaty on the Nonproliferation of Nuclear Weapons and to IAEA safeguards" ; "The United States affirmed that it has no intention to attack or invade the DPRK with nuclear or conventional weapons"; "The DPRK and the United States undertook to respect each other's sovereignty, exist peacefully together, and take steps to normalize their relations subject to their respective bilateral policies"; "The directly related parties will negotiate a permanent peace regime on the Korean Peninsula", etc. These core contents embodied the largest convergence of the interests of various parties at that time, and aren't they remaining the long-cherished goal for the relevant directly concerned parties of the Korean Peninsula issue? Comparing how the Korean Peninsula nuclear issue has evolved with where it stands today, we will find that we can still draw upon the precious experience that enables the signing of the September 19 Joint Statement, which includes: grasping the fact that the core of the Korean Peninsula nuclear issue is the security issue and the crux of the issue is the conflict between the US and the DPRK; addressing the concerns of various parties in a balanced, synchronized and reciprocal manner and following the principle of commitment for commitment and action for action. We believe if all the relevant parties can return to these basic consensus and discuss the approach to balancedly resolve the legitimate concerns of various parties in line with the principles and spirits embodied in the September 19 Joint Statement, we will see a favorable turn in the peaceful settlement of the Korean Peninsula nuclear issue. It is based on the fore-mentioned spirits that China proposed the dual-track approach and "suspension for suspension" initiative, and we still believe the Six-Party Talks are an effective platform for peacefully resolving the Korean Peninsula nuclear issue. Indeed, we remain open to all efforts that are conducive to the peaceful settlement of the Korean Peninsula nuclear issue through political and diplomatic means. Q: The European Union Chamber of Commerce today said that it hopes after the 19th National Congress of the Communist Party of China, that the new Chinese leadership can send a clear statement that it will continue implementing economic reform. If China doesn't follow through with market access reform, there will be frictions. What is your comment on that? A: I haven't seen the relevant report you mentioned, but China's policy is clear-cut. Since the end of 1978, reform and opening-up has always been the fundamental state policy we have upheld. China has achieved great development through reform and opening-up, and the world also gained enormous interests from China's reform and opening-up and the benign interaction with China. 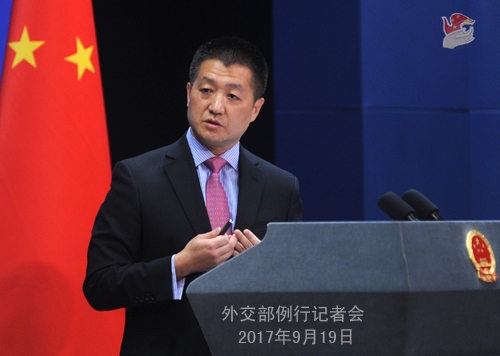 On the part of China itself, we have achieved development through reform and opening-up, and have no reason to give up it. In fact, you all have seen that, since the 3rd Plenary Session of 18th CPC Central Committee, we have formulated a series of measures to comprehensively deepen reform and attained enormous achievements. I don't understand why certain party will doubt China's commitment to reform and opening-up as is beneficial to itself and the world at large?